Jordan’s Foreign Minister says Arab countries will provide security for Israel if it withdraws from Judea and Samaria. 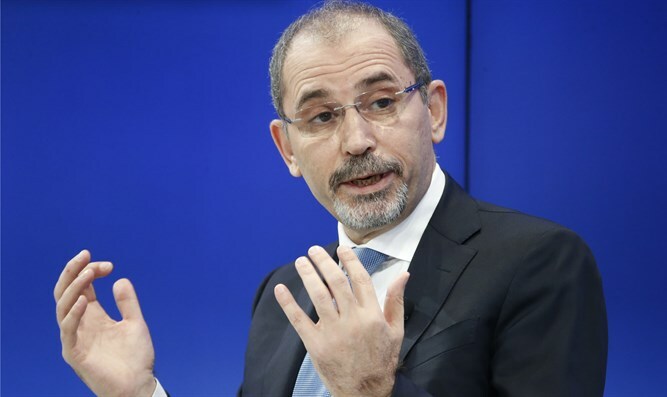 Jordan’s Foreign Minister Ayman Safadi on Saturday said Arab countries would provide security for Israel if it withdraws from Judea and Samaria. Safadi's comments came during a meeting with in Moscow with his counterpart, Sergey Lavrov. “In order for Israel to live in peace with the Arabs, it is necessary for them to leave the territories occupied after 1967. So if this happens, the Arab countries will be ready to give security guarantees to Israel,” the Jordanian minister said, according to the Russian Sputnik news agency. Safadi added that the Israeli-Palestinian Authority (PA) conflict was a key concern for the Middle East. “We consider the settlement of the Palestinian problem as a core of tensions in our region. That is why we definitely plan to create additional conditions for security and stability in our region and in the whole world,” he said, according to Sputnik. The PA insists Israel withdraw from Judea and Samaria as part of a peace agreement. Prime Minister Binyamin Netanyahu has repeatedly warned that doing so would jeopardize Israel's security and demands that the IDF maintain security control in any future Palestinian state. PA chairman Mahmoud Abbas, for his part, has repeatedly stressed that a future Palestinian state will be free of Jews, civilians or soldiers. Safadi's comments are similar to ones made recently by Jordan's King Abdullah in an interview with The Washington Post. "The whole point of our peace initiative is for us to be the guarantors of Israel’s security. If we can solve the Palestinian problem, then this is a new era of stability in our area, where Israelis are truly a part of the neighborhood," he claimed.